This page lists products and resources available from the Communication and Conflict website. 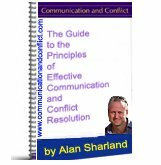 The Guide to the Principles of Effective Communication and Conflict Resolution e-book. Listening, Summarising and Questioning - The Simple, Effective Skills of Conflict Resolution. Purchase this e-booklet of the webpages describing all 3 skills with some additional comments and clarifications for just $3! Click here to find out more about this ebooklet. Purchase and download it now for easy reference. Would you like to create your own website? Click here to go to a page that describes how I was able to build the Communication and Conflict website with no previous experience of building websites. Are you a Mediator who would like mentoring support? Are you experiencing difficulty with a conflict or with your communication skills? If you have Skype, you can call me for a Coaching session. Purchase the book on Amazon in Kindle or Paperback by clicking on the image above or the following link: How to Resolve Bullying in the Workplace : Stepping out of the Circle of Blame to Create an Effective Outcome for All.